December is probably one of my most favorite months of the entire year; it's so warm & cozy, I love the festive feeling that you get when you see all the sparkling lights, the decorated storefronts, and the wrapped presents with the shiny bows. Let's see how I did on November's goals. . . I do have my cards in, but my oldest sister is doing calligraphy on them so when she returns them to me this weekend I'll make sure to get them mail out quickly! I'm almost done, I just have to purchase a few more things for Christopher & two other gifts-I'll be done! I'm so excited to have kept up with this throughout the month of November & I'll definitely carry it out through December as well. I tested out a recipe for sweet potato casserole & it was a hit at our Thanksgiving gathering. I'll be preparing it again for a family Christmas party, so I'm excited about that too. I got the Christmas decor up the day after Thanksgiving! For December's Goals. . .
We have a family Christmas gathering & I'm so excited to host everyone! This is such a busy time of the year for me & so I'm in the middle of a book and I really would love to finish it before the New Year! Chris & I bought a used elliptical machine a few weeks ago & it's still in our garage. I need to move it into our basement and then try to get in at least two workouts per week if I can squeeze them in-we'll see how it goes! I have been working on growing my Instagram & since I hit 950 I've been growing faster, which I am so thankful for! I would love to hit 1,000 followers by the end of the year! Let me know below what your goals are for the last month of 2017! I've been trying to get at least a LITTLE ahead of the game this month so far! Good luck with your goals girlie! Love your new goals! I'm also trying to hit 1k on Insta before the end of the year and I'm so close! I'm so jealous that you got an elliptical! I think I'd be much more motivated to work out if we had a home gym. Good luck on your goals this month. I finally finished my shopping. Yay! Sending out Christmas cards is so much fun, I have mailed them out slowly. So fun you are hosting a Christmas party, I always love hosting parties! Good luck with your goals this month! I'm just trying to relax and get some projects off my to do lists and returns done before the holiday rush! Best of luck with your goals! I’ve been thinking about getting an elliptical or other gym thing in my house. You’ll have to update on how yours is working out! Have fun hosting your Christmas gathering! They can be stressful but once everyone is over it's so nice to get to spend time with friends and family and just enjoy their company. PS - SO jealous about your new elliptical! I want one so bad, but I don't have anywhere to put one. I reaaaally need to finish my Christmas shopping! Its stressing me out! Lucky girl! I would love to have an elliptical at home! You always have the best goals! I need to finish my Christmas shopping as well. 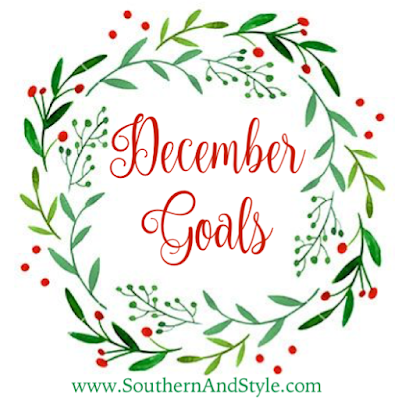 I love your December goals! How was your Christmas Party?